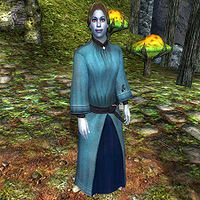 Mirili Ulven is a Dunmer sorceress living in the settlement of Highcross. She is very focused on her research into the life forms of the Shivering Isles, its weather changes, and the cycles of the moon and stars. She wears a mage's robe and a pair of huntsman moccasins. She is equipped with an enchanted dagger and carries her key and a variable amount of gold. Mirili knows spells from the Alteration, Destruction, Illusion, and Restoration schools of magic. She also possesses a unique fortify health ability that raises her health by 150. They say there's a newcomer about. I wonder where he's from? I'll have to update my encyclopedia. I had an entire volume devoted to the Gatekeeper, and now he's dead. I suspect that the Resonator is affecting the migration patterns of baliwogs, but it's going to take years of study to be sure. Everyone's talking about Duke Thadon and his Chalice. How tedious. Don't people understand I have important work to finish? The palace intrigues of the House of Dementia are of no interest to me. People are all excited about the Great Torch being relit. Personally, I don't pay any attention to politics. I understand Dementia has a new leader. Not my area of interest, honestly. I understand Mania has a new leader. Not my area of interest, honestly. All my work on the Fringe... wasted. I'll have to begin my research all over again. I'd be very interested in taking a look at this new Gatekeeper. An entirely new form of life! The tedious to-ings and fro-ings of the armies of Sheogorath are of no interest to me. People act like Sheogorath's disappearance is of some grave significance. But the Shivering Isles are the same as ever, I assure you. With the Greymarch ended, I need to devote some serious study to the obelisks. They have proven more interesting than I had thought. When Mirili is plant collecting, it is very easy for her to meet her death as she sometimes strays too close to the Frenzied Camp where she will be attacked by Heretics. These spells are only buyable after reaching the Bestiary stage of Taxonomy of Obsession and cannot be bought once the quest is completed. The spells must be bought through dialog options, instead of the usual Spell Service button. This page was last modified on 15 December 2016, at 17:08.